I didn’t want to laugh at the government for fleeing under a mere anthrax scare. Instead, I cheered Lisa Beamer’s courage and thought of the irony of it all. Here is a pregnant woman flying on the same flight her husband took September 11 when he rallied other passengers to thwart the Terrorists’ plans to either crash into the White House, the Capitol or collide with Air Force One. And here is the entire representative government of the most powerful nation on earth cowering and hiding from a mere scare! Semper Vigilantes, Lisa Beamer. Yes, Always Vigilant, I thought. At the moment I was lauding Lisa Beamer, I was feeling empty and desolate about my faith in the courage of government to deal with homefront issues—like helping average citizens—parents, grandparents, uncles, aunts, nieces, nephews and children—fight fear with courage. I knew that Terrorism feeds on fear and intimidation, and if our entire representative government ran for cover at the mere threat of a terrorist intrusion, what did that signal the country? Thank God, I thought, the Senate stayed in session. At least they had the common sense and decency not to show how pitiful all of government can be. Congress’ retreat to the “high ground” was a brutal lesson for all of us. It tells us whom we should count on when the chips are down. If the government is going to run away in the face of possible fear, then who will protect us from FEAR itself? I vote for Lisa Beamer over Congress. Yet there are many individuals who look to government to protect them, and their families from Terrorism’s threat. They presume the government is resolving the problem with bombs, bullets and Home Security legislation designed to strip of us of basic rights so the “government” can protect us. Is this the same government that ran away today(Oct. 19)-- the government to whom we are willing to sacrifice many of our inalienable rights to protect us from Terrorism? I felt chills up my spine thinking of the paradox—the frightened leaders are going to save the courageous people from fear’s harm! I began to think about what it meant when the Representatives of the People rush out in fear over a scare--a mere threat. It brings up a vital question: Who comes first--the politicians or the people? I wondered what image the Congress left in the minds of future Terrorists as they bailed out in a rush of personal selfishness. Would the future Terrorists smirk, realizing a mere scare could drive the United States government into hiding? Perhaps I was too rash, I thought. Maybe one lonely Congressperson didn’t flee with his or her tail between his or legs. I searched the papers for that one Congressional Representative who refused to leave the Chambers—the one that sat there until the guards had to lift him or her out of the seat screaming and kicking. I hoped to find one representative Voice of dissent amongst the fleeing sheep. No where could I find a photo or story depicting a Congressperson clutching his or her chair, fighting those who tried to eject him or her. What a photo op, I thought. Yet FEAR overpowered political savvy. Cowardice ruled Vigilance. Not one kicking, screaming, fighting-for-faith-rather-than-promoting FEAR Congressperson could be seen on the news pages or television. Of course, I can hardly wait to hear those Congressional Representatives who will puff out their chests and crow how much they were against the decision to close the House, and how they wanted to stay and work and show America’s people and the world they couldn’t be intimidated. But that’s all cheap rhetoric. If any politician felt that strongly, they would have had to carry them out kicking and screaming. Our nation’s leaders abandoned us—those are the facts. With, of course, the exception of Lisa Beamer. She grabbed hold of her Fear, held it captive, and climbed aboard former United Flight 93 in Newark heading for San Francisco. The fear she faced was ten-fold greater than the anthrax scare that scattered our politicians. Lisa Beamer chose Courage, Conviction and Action rather than to fall victim to Fear, Intimidation and Complacency as our Congress did. That’s why Americans can’t count on government to fight Terrorism. Not on the homefront. Certainly, they can bomb and hunt and execute Terrorists from afar, but Terrorism is a state of mind. It is the fear of attack that must be fought in the homeland. It is the fear Terrorism instills in a child that must be countered with the weapons of Courage and Conviction that Lisa Beamer illustrated when she boarded her husband’s ill-fated flight to show the world facing rather than running from fear is the key to conquering it. I would like to nominate Lisa Beamer as the Semper Vigilantes Mother Of The Year! I’d like to make her the head of the Parents of Vigilance movement. She knows what it takes to tell a child to not be afraid. 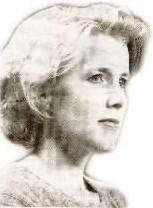 She set the example of Courage, and Congress set the example of Cowardice in the face of Fear. I’m afraid he didn’t. If he had bottom-lined that question, he would have kept Congress open. I think Lisa boarded the plane for all the children, and Congress ran away because children weren’t their concern. And I wondered if Speaker Hastret thought about Lisa Beamer’s 32-year old husband, Todd, and how he and other citizens aboard Fight 93 sacrificed themselves to save the lives of many of the Congresspeople who ran at the threat of a “possible” anthrax scare. I wonder how many Congresspeople thought about Todd Beamer’s courage in the face of death when he and others protected the plane from crashing into the White House, or perhaps the U.S. Capitol? Todd Beamer, and the other forty-three passengers on Fight 93, didn’t think their lives were worth more than any others. If they had, they would probably have sat quietly and not attacked the Terrorists to save Speaker Hastret or other U.S. elected representatives. Yet today, Congress sent the signal that their lives were more important than their constituents’ lives. They sent the message they, as our leaders, aren’t willing to die for us—as the citizens of Flight 93 were willing to die for them. It appears to me that our Congress is not the staunch source of Protection we should look upon to battle Terrorism. Those among us who believe government has the power, the will and fortitude to resolve the issue of Terrorism need to look at an empty house of Congress and rethink the will of government. They need to realize that the government has ample supplies of antibiotics to cure anyone infected in Congress, while most of the nation’s hospitals suffer from a lack of them. Yet, even with the cure to any exposure readily available, Congress turned and ran away from its citizens. This brings up some serious questions each parent needs to answer about who is in charge of their children’s safety in the face of fear. Do the parents of America really believe their congressional leaders would throw their body in front of their children if threatened? Do you think Dennis Hastret would throw his body in front of your child and take a Terrorist bullet, or would he run the other way? If the Congress is so frightened to shut down its doors over an anthrax scare, what protection will they insure the mothers and fathers of America if and when Terrorism kicks up again in our country? Todd Beamer knew what to do. He knew how to die for what he believed. That’s why I urge you all to look at yourselves as the Government Of The Children and not to Washington D.C. If there is going to be a Home Security force within this country, let’s not put it in the hands of government. Based on today’s behavior, who really thinks the government has the conviction or courage to provide security for our children, our neighborhoods, our communities? Instead, let Congress’ actions be a lesson in parental management. Let its fleeing be reason for you to deeply consider becoming part of the Parents Of Vigilance. Join others throughout your community who realize the true Home Security of your community is dependent on parents’ not government’s vigilance over Fear, Intimidation and Complacency. 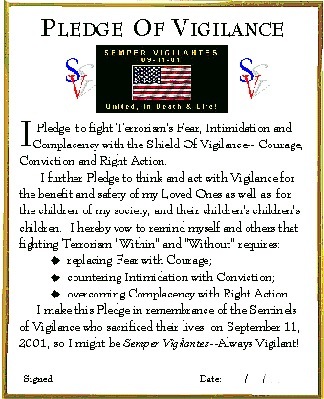 Use the principles of Semper Vigilantes to create a grass roots wave of the same degree of Courage, Conviction and Action that Lisa Beamer showed today when she boarded her flight of fear, and looked Terrorism in the eye rather than run from it. Think of Todd Beamer giving his life, and those other brave Parents of Vigilance aboard Flight 93 who saved our government and its officials a horrible death—who were willing to die for their Congressmen and Congresswomen, for their President and Vice President. Then decide who should govern your children’s future protection. Should it be the government, or, the Sentinels of Vigilance? Chose one or the other, otherwise you’ll be running from your responsibility as Congress did today. Go To: "Sentinels Of Vigilance Created From Rubble"